The Rolls Royce Ghost White is the perfect blend of function and style taken to the highest extreme. Everywhere you look inside there is the finest leather and hardwood trim providing the epitome of luxurious traveling. Everything you could think of is included and even some amenities that you could never imagine, such as a built in ice bucket and fold down tray to hold your champagne and flutes while you enjoy the South Florida scenery. More than just the most beautiful car on the road, the five hundred and sixty nine horsepower engine will make you know that you can negotiate the menacing Miami traffic comfortably while getting you where you need to be, when you need to be there. 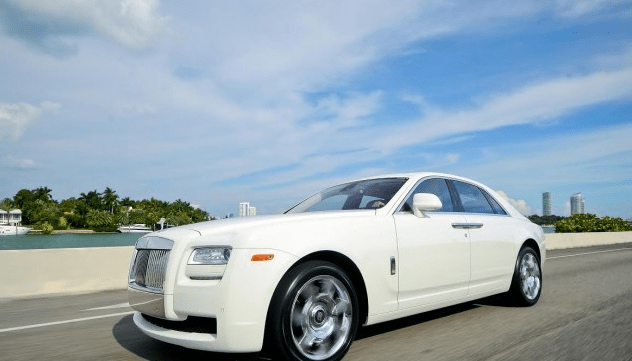 Be revered for your flair, style, refinement and of course your wealth when you are chauffeured in your Roll Royce Phantom Ghost. (We can provide the hired driver also).